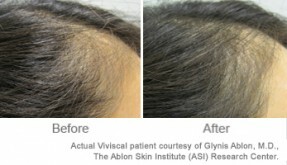 Unhealthy hair follicles can result in hair growth that is thin, fine and weak at the roots. 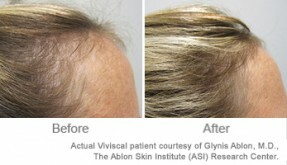 When hair follicles are damaged, they can shrink in size, resulting in thinner hair strands that are easily breakable. 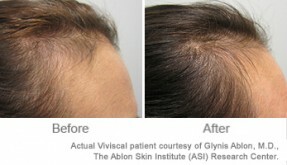 To compound the issue, hair won’t grow as long because it’ll be prone to breaking before it can reach your goal lengths. The result? Hair looks visibly thinner. 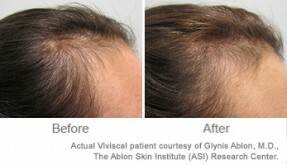 The more efficiently your hair grows, the thicker it will be. 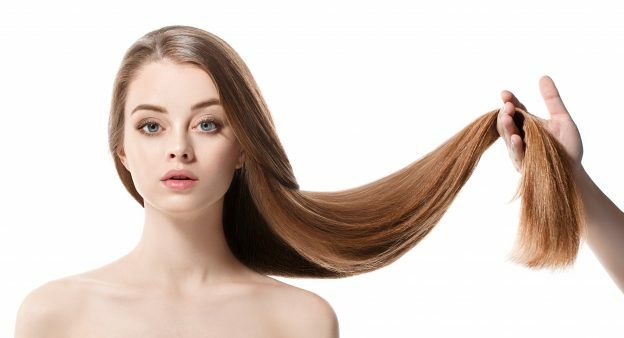 Try these remedies to thicken thin hair by improving hair follicle health. Staying hydrated is important for all body functions, including growing hair. Drinking more water will ensure adequate moisture for your hair follicles and scalp. A 2016 study found that doing a four-minute scalp massage every day for 24 weeks resulted in thicker hair. Why? Because massaging improves blood circulation to the scalp and allows your hair follicles to receive adequate nutrition for hair growth. Ask a friend or partner for a scalp massage or do it yourself. Massage has the added benefit of reducing stress, which can also improve hair health. In a 2015 study, researchers found that topical application of rosemary essential oil significantly increased hair count after a period of six months. Mix 2 drops of rosemary oil into several tablespoons of a carrier oil like olive oil. Gently massage the oil mixture into scalp and allow to sit for 30 minutes. 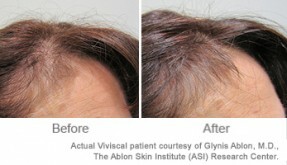 While hair extensions may seem like a solution for thinning hair, in the long term, they can cause more harm than good. Any hairstyle that pulls tightly on the hair follicles can damage them, resulting in thinner, more damaged hair over time. Avoid too-tight braids, ponytails, buns, and too-heavy hair extensions, all of which can destroy hair strands and even lead to traction alopecia. In a 2010 study, researchers found that a vitamin E supplement increased hair count by 34.5% after eight months. Vitamin E is an antioxidant, so this improvement in hair growth was attributed to vitamin E’s ability to fight free radicals that cause damage to hair follicles. For stronger hair roots at home, massage a few drops of vitamin E oil into the scalp. Allow to sit overnight, then wash with a mild shampoo in the morning. According to researchers at the Harvard School of Public Health, smoking reduces blood flow to the scalp, preventing hair follicles from receiving adequate nutrition to grow healthy hair. 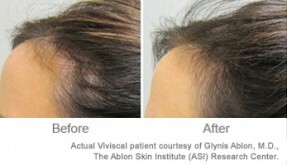 Plus, according to the same study, smoking increases certain hormones that contribute to hair loss. Just another reason to ditch this unhealthy habit! A healthy diet rich in protein, healthy fats, vitamins and minerals will help support hair growth. Experts recommend incorporating foods like chicken, fish, eggs, nuts, sweet potatoes and leafy greens into your diet to improve hair follicle health. Avoid refined sugars, trans fats, and any foods you may be allergic to (not only could this be potentially dangerous, but even a mild allergy could cause inflammation, which could impact hair’s health). Also critical: eating enough calories! When we don’t eat enough food, our hormones can fluctuate and our hair suffers as a result. Even if we eat a healthy diet, it can be difficult to take in all of the nutrients required for healthy hair growth*. After all, your body does not consider hair growth an essential bodily function compared to processes like supporting vital organs. So take a hair supplement like Viviscal to ensure that your hair follicles are getting the key dietary requirements needed to promote existing hair growth*.